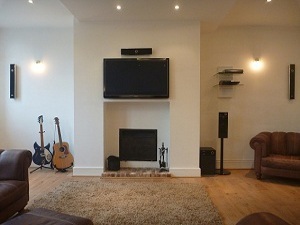 AV Installs Bespoke Home Theatre Service is suitable for all surround sound systems from high street home entertainment equipment to custom In ceiling surround sound speakers and AV receivers. This includes single speaker Sound bars along with 2.1, 3.1, 5.1, 7.1, 9.1,11.2 speaker systems.Our own in house audio visual engineers will assist in deciding where to place the speaker enclosures and professionally wall mount or ceiling mount the speakers in the correct positions. This service gives customers the peace of mind that their expensive audio equipment is installed neatly, professionally and correctly. Included with the bespoke Home Theatre Installation is AV Installs hidden cabling service, AV Installs specialises in concealing home cinema cables in all wall types from dot & dab, brick, plasterboard, stud and solid walls, all necessary repair work will be undertaken. As standard the service comes with a double gang white plastic brush plate for the speaker cables to exit behind the home entertainment or AV receiver. After all the speakers and auxiliary devises are connected our engineer will make any necessary changes and minor tweaks to the system required. In some case providing the equipment will support it AV installs will use the microphones and calibration software supplied with the AV receiver. The Bespoke Home Theatre Installation Service is a fixed priced service, subject to a complete telephone survey and a official written quotation which will be emailed along with our full terms and conditions. All installations come complete with a full one year installation warranty and a customer satisfaction sign off sheet. AV Installs is a Northamptonshire Trading Standards Approved Buy With Confidence Member and only uses its own engineers which are CRB checked.